“Don’t judge anyone. Respect who they are and be flexible with individual needs,” says Sandra Harvey , who recently took up a fulltime role at Northland Region Corrections Facility as art tutor and distance learning facilitator. Sandra, who has a visual arts degree and has worked as a technician and tutor in the art department at Northtec’s Bay of Islands campus, believes the arts can be a valuable therapeutic and rehabilitative tool. “Art allows a person to let go of the present and focus on a future, on a different world,” she says. Prison is a challenging environment for many prisoners but the arts offer a powerful way to channel their issues, Sandra says. The arts can also provide a connection with the community and become an employment option for some when they’re released. 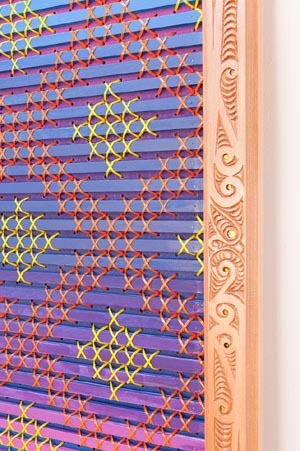 Sandra cites the recent exhibition of prisoners’ artwork at the Kaan Zamaan Gallery in Kerikeri. 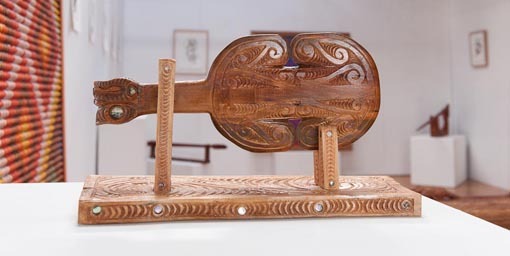 The community supported the exhibition, which was facilitated by Northland Region Corrections Facility, and one prisoner sold eight pieces. The process of exhibiting has had a positive impact on the prisoner artists, she says. They have seen people from the Department and from the community following through on their actions to make it all happen. It has given the men a sense of achievement and pride. And for some, it has provided a confidence boost in their own potential to make a living out of their art. Many of the prisoners Sandra works with have failed at school. In prison, however, they are given another chance to gain qualifications through long-distance learning institutions Te Aho O Te Kura Pounamu – the Correspondence School and The Learning Connexion. 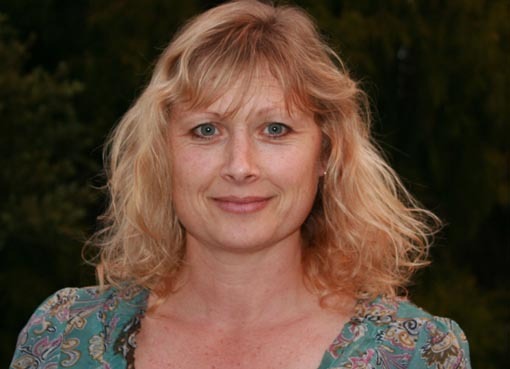 Sandra’s role is to facilitate and support the men’s studies as they work through various modules to gain credits in Level 1 art as part of the National Curriculum of Educational Achievement (NCEA). She also finds ways to broaden the men’s experience by working with the local community. They’ve created murals throughout the Kaikohe community and now, a local butcher has asked if they could create a mural for his premises. At the moment, the men are creating painted panels of wood carvings in one of the prison’s dining rooms – an initiative aimed at developing a more stimulating environment and creating pride within the unit. Sandra acknowledges the challenges that come with working in a prison environment but says the positives far outweigh the negatives. The artistic breakthroughs that the men make are compelling and she enjoys providing the resources the men need to explore and share their stories. Sandra believes that some of the prisoners are wary of getting in touch with their emotions because they are in survival mode. “More often than not, these prisoners have suffered great challenges and trauma in their lives. This can fuel some pretty meaningful artworks. Sandra would like to see the prisoners being able to take their education to a higher level and is exploring options with institutions that offer extramural learning options in the visual arts at a bachelor and masters degree level. Original generation time 1.6198 seconds. Cache Loaded in: 0.0370 seconds.